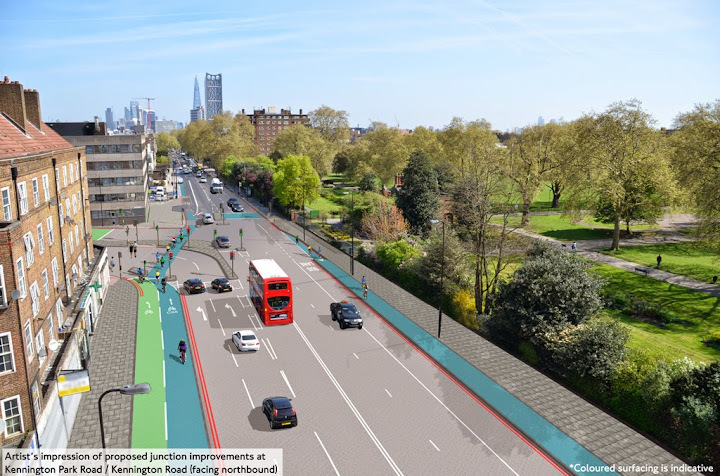 The roads around Oval junction are set to be made much more cycle friendly following confirmation from Transport for London that they will go ahead with the ambitious plans for the junctions outlined in July. The original proposals, published in July 2014, were developed with Lambeth Cyclists and the wider London Cycling Campaign as part of the Mayor of London's Better Junctions initiative. Following a public consultation in which the majority of responses welcomed the scheme the plans are set to be fully implemented. This means that the four junctions at Kennington Park Road, Clapham Road, Camberwell New Road and Brixton Road will be redesigned to give priority to cyclists (see map below or on Tfl website). Additional measures such as banning left turns and introducing mandatory two metre cycle lanes will cut down on speeding traffic and make the area more cycle friendly. The green space in the middle of the road opposite Oval tube station is also set to be upgraded and improved. Work is set to begin in December 2014 and will be completed by April 2015. 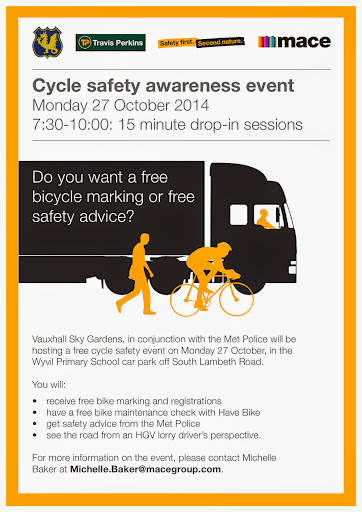 Vauxhall Sky Gardens in conjunction with the Metropolitan Police are offering a free cycle safety awareness events next Monday morning, 27 October 2014, 7:30-10am at Wyvil Primary School, South Lanbeth Road, SW8. Get your bike checked and adjusted so that its safe for autumn and winter riding, get it registered with the Police so that if found you can be easily reunited with it and see how to avoid getting into lorry drivers' blind spots. We hope you can join us this evening, Tuesday 21 October 2014, for our meeting. 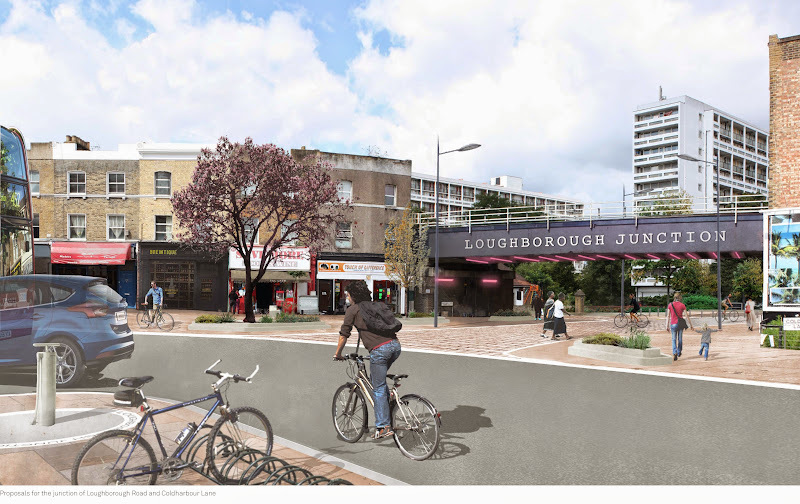 At the meeting we will be looking at all the latest cycling developments in the borough including the Loughborouh Junction and Myatt's Fields proposals. We also be looking at the Clapham Old Town redevelopment which opened to great fanfare at the start of the summer but can only be described as 'good in parts' for cyclists. We will be offering feedback on the development to Lambeth so that we hope it can be improved and made more cycle friendly. The meeting will take place at the Stockwell Resource Centre, 1 Studley Road, SW4 7:30-9:00pm. The Centre is located behind Stockwell tube station with cycle parking in the forecourt. 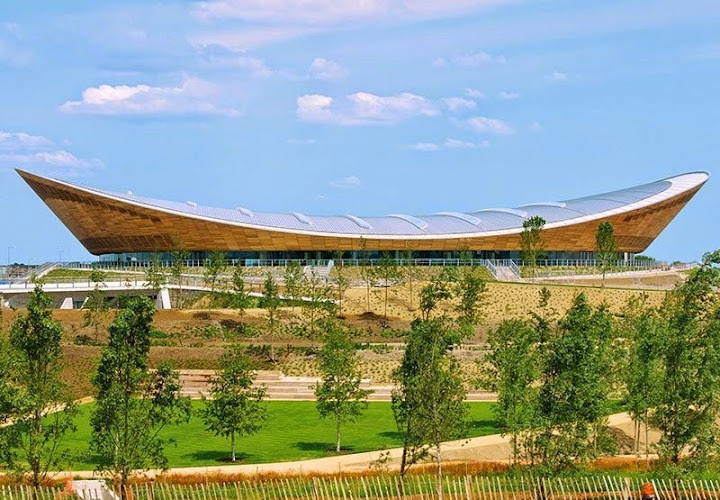 The ride will visit three areas of large-scale regeneration in London to look at the architecture and design. We will also consider other social and environmental issues such as What is the provision for cycling? And public space? Have former industrial buildings been reused and converted successfully? Is there sufficient social housing? 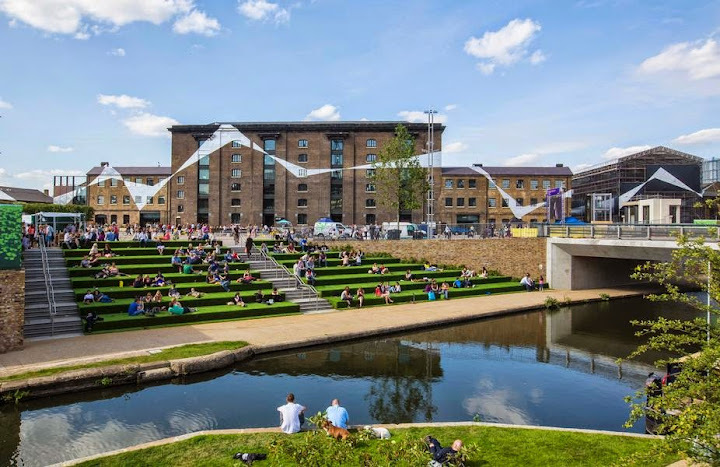 We will start at a site of regeneration in progress - the Elephant and Castle, and then continue up to Kings Cross, already substantially rebuilt with the new Granary Square and Central Saint Martins, plus new buildings by David Chipperfield and Allies and Morrison. Heading east, the ride will then travel to the area in which the London 2012 Olympics took place including the Olympic Velodrome and Aquatic Centre as well as the Athletes' Village (now flats), four new innovative 'stumbling play' children's playgrounds (in the Olympic Park and Victoria Park), a new pagoda, several new bridges and sites of new developments in Fish Island and Hackney Wick, as well as the Olympic Park. There will be a stop for lunch at a cafe, probably at Victoria Park, and we will aim to finish around 4.30pm in Stratford. Here you can either cycle back to Lambeth or take the train - DLR and London Overground allow bikes to be carried. Meet: Saturday 25 October 2014 10.15am for a 10.30am start outside the Elephant and Castle Shopping Centre West side, Walworth Road opposite the Strata (black and white building that looks like a lighter). The ride will be led by Tessa Wright (07949 785258) and Tom Bogdanowicz. See the latest Cyclehoop promotional film featuring the 100th Lambeth bike hangar in Brixton which was unveiled in September. Lambeth Cyclists member Clare Neely here reflects on the benefits that ending rat runs and making the streets more people friendly have brought to her area to the South of Coldharbour Lane in Lambeth SE5. The high cost of my contents insurance does not reflect the low number of burglaries. As our local police officer puts it "thieves like rat runs, makes it easy for them to escape"
I watch the pleasure on the faces of people walking and cycling through the area, as they enjoy our quiet residential streets. 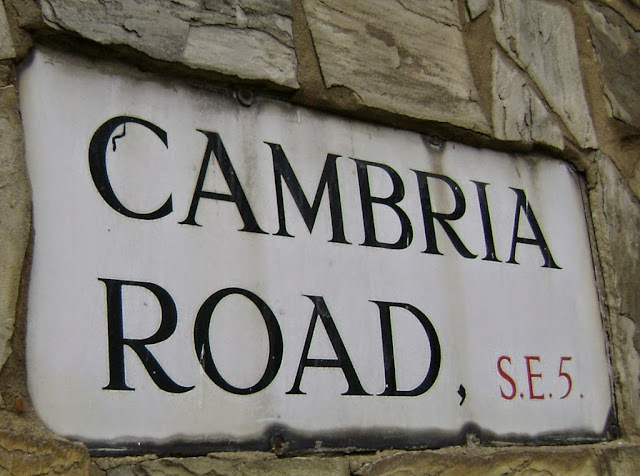 Many of my neighbours objected vehemently to the proposal to close Cambria Rd - "it will increase my journey time", "the traffic on Herne Hill Road and Denmark Hill will come to a standstill" etc etc. The traffic still flows as freely on Herne Hill Road, and Denmark Hill, probably because many people now feel safe to walk and cycle, rather than drive. Increase in journey time? Every neighbourhood is unique, but I found that because the amount of traffic was less without the rat running traffic, even though I had to drive further, my overall journey time wasn't very different. Based on my experience, I am a passionate supporter of the scheme for Loughborough Junction and Myatt's Fields. I don't want my neighbours in those areas to be denied the enormous pleasure of walking, cycling, and living, on a quiet residential street, without rat running traffic. 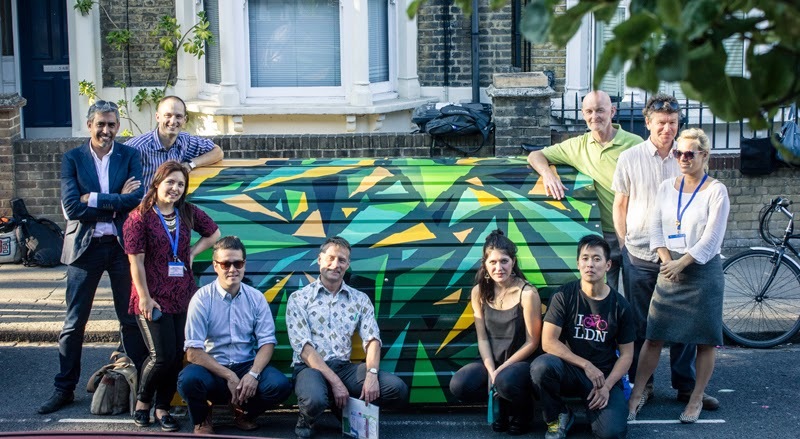 At the end of September the 100th bike hangar was installed in Saltoun Road, central Brixton with a celebration by the company responsible, Cyclehoop, and Lambeth Transport Department. The bike hangars are an innovative solution to bike storage needs in an inner-city borough such as Lambeth where space is at a premium: most flats and houses lack suitable outside or inside storage space. Each bike hangar provides six secure bike parking spaces in a special waterproof metal container. Bike parking spaces in the hangars are available to Lambeth residents at a cost of £42 a year per bike. With the unveiling of the 100th hangar Lambeth is providing storage space for 600 bikes. To meet demand it is essential that Lambeth provide many more of these across the borough. The Lambeth Cycling Strategy sets the target of getting 20% of the population cycling by 2020 - this would imply that storage space is required for 40-50,000 bikes in total across the borough. To find out more about the bike hangars and to request one in your area see www.cyclehoop.com/rentals. See also the bike hangar section of the Lambeth website.